Ever since the birth of computers, enthusiasts and fans around the world have collected together in garages, universities and pubs to talk about their interest, learn from each other and help promote their interest. Combine this with the huge popularity of Ubuntu, and you get the Ubuntu Local Community (LoCo) project. A LoCo team is formed to help groups of Ubuntu fans and enthusiasts in a particular region to help advocate, promote, translate, develop and otherwise improve Ubuntu. With the support of Jono Bacon, the Ubuntu Community Manager, and the awesome Australian Team, we're launching a New Zealand team for Ubuntu (http://ubuntu-nz.org/). There are no set goals for the team yet - it's entirely up to you, the new members, to decide as a group what we should do. There are many, many ways to ContributeToUbuntu! Involvement in a LoCo is an easy way to get involved with the global Ubuntu community for non-developers and developers alike. There are people involved from many teams within Ubuntu who can help you gain useful skills for further involvement if you are keen! 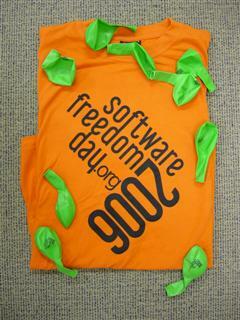 Software Freedom Day - all over! Thanks to everyone who helped out with WLUG's Software Freedom Day event. There is a good writeup and some pictures online at the SFD website. t this point I should also announce I am not standing for re-election on the WLUG committee next year. I've been secretary since we founded officially four years ago, through three presidents, vice-presidents and treasurers, and over 10 general committee members. It's been a great way to contribute to the open source community and I really hope that someone new and fresh gets involved. Fear not, I'll still be involved; my current goal is relaunching the Ubuntu NZ local community team. APC IEC C19-C20 jumper cable, part AP9887. Ingram Micro part number APC1883. How much would you pay? My NetworkManager PPTP plugin package for Ubuntu is sitting in the REVU queue. If all goes well it will be approved and end up in Universe for Edgy. SFD preparations are coming along. We have people hard at work preparing 150 copies of the Kia Ora CD, a fantastic open source software CD for Windows, collated by zcat from WLUG, and of course we have 300 Ubuntu CDs to give away. Oh, and MythTV 0.20 is out. Make sure you get 0.20a, as a big MythWeb bug slipped in at the last minute. All going well, it'll make Edgy, if a simple sync from Debian Multimedia is possible. It is assumed that members of the same household, workplace or close friends would purchase goods off each other outside of the Trade Me auction process. Hence bidding by family members, flatmates or friends is considered "shill bidding" and is in breach of our terms and conditions. Re: section 4.2 of the Trade Me terms and conditions "You shall not manipulate prices through ghost-bidding or assuming multiple roles in a single transaction." It appears that members that you are linked to were bidding on your auction #69170303 and this is considered shill bidding. You are welcome to list this on the site again, permitted that no further shill bidding occurs. Unfortunately you will need to do this manually as we are unable to restore the listing. If you have any further questions or if I can be of any further help please do not hesitate to contact me. I managed to get a copy of the original text out of Trade Me, via a friend IMing someone who worked there. (Ironically, it was the same friend who was trying to buy the laptop!) However, I paid promotion fees which I have not been refunded. I'll get back in touch (there is no 'reply' facility, I'll have to just use their contact form again). My problem is that their initial assumption is wrong. People do not always conduct their sales outside of Trade Me, for reasons previously stated. We got two T-shirts free and bought another four (thanks to Pia for arranging them when the web site got frazzled), both to wear, and to support the cause. We're making progress with everything and hope to see as many people at Centreplace in Hamilton on Saturday 16 September as we can. A couple of days ago, I listed some Thinkpads on Trade Me on behalf of my employer, who has accumulated too many of them. He specifically wanted them listed so they would fetch what they were worth, rather than us putting a dollar figure on it and selling it cheap to a friend. Then, I told you all about them. My boss likes to sell things off cheap. You might get a bargain. Promotion is everything. A friend of mine, who now lives in Australia, said "Oh, yes, I'd like one of those", and created a Trade Me account for the purpose. Someone posted on the auction saying "Beware of saidperson, they're a new user in Australia", and I responded along the lines of "thanks, but I went to Uni with this person, and they're genuinely interested in purchasing it because of the favourable AUD-NZD rate at the moment"
attention that shill bidding has occurred on your auction. item or is an attempt to increase the price on an auction. allow friends or family members to bid on your auctions in the future. Your co-operation in this matter would be greatly appreciated. So, I try and take the path that leads to Trade Me making a successful sale, openly and honestly, and this is how I get rewarded. Kyle very accurately observes "if it was happening to things you wanted to buy with sellers creating new accounts and bidding against their own items we'd be pissed off if they didnt stop it". Correct, but this happens all the time. My friends list auctions and say "Here is stuff I'm getting rid of", and if I'm interested, I bid. I only ever bid up to a point that I'm prepared to pay, should I win the auction. That's not shill bidding. Where's the beef? Want to buy a Thinkpad? Including 250 Dapper Drake PC CDs, and 60 Ubuntu stickers.